Happy Monday all my awesome followers! Man this weekend was so much fun but so busy. 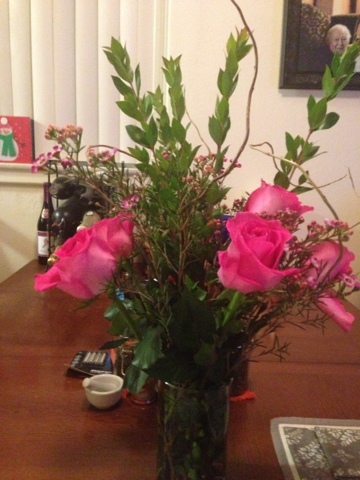 As I mentioned before , Friday was the hubby and my valentines day celebration. He had a surprised planned and when I got home he had completely cleaned and rearranged our apartment. We live in a small-ish 2 bedroom apartment and since the wedding and all the gifts/stuff it brought to us we ran out of room. We had a "spare" bedroom that you literally couldn't step into. 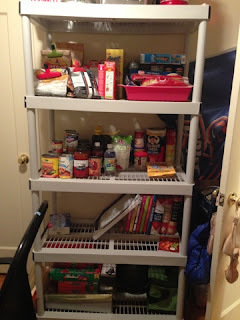 It had become this storage room where we would through anything we didn't want cluttering the living area or our room. We also had a storage unit that came with the apartment but given that my husband moved from Kentucky that little thing got pretty damn bad too. My hubby cleaned and organized our storage unit, emptied out and boxed up our spare bedroom then added those organized boxes to the storage unit, then he made me a pantry meaning a shelving system put in the spare bedroom and now I have 3 free cupboards in my kitchen! Yay for finally being organized and getting rid of the "Tetris" that we called our cupboards. He also cleaned the kitchen and set up one of my old mini TVs in there so I can watch DVDs while I cook. 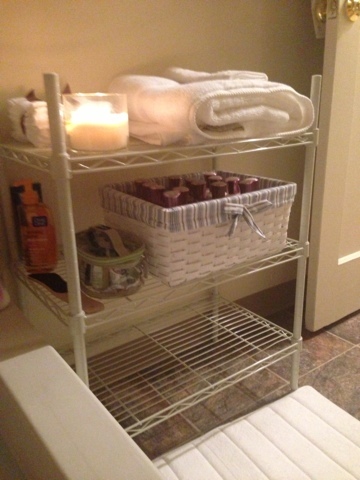 He also fixed our bathroom and made me an organized bath station since I take a bath every day. I have my own bath mat and towel just for me. Finally, I got flowers from our wedding florist. The best thing about it was that I would NEVER ask him to do that for me, I always assumed someday when we both had a full day off we'd do it together. He also showed me that he listened to my little complaints and changed it for me. It was a really thoughtful idea and I am finally loving our apartment. We went out to dinner that night, then caught up on TV shows. It was a great valentines day, I just feel bad because I only got him something small. I got him the James Bond sky fall DVD, and tickets to the band fun. Concert in August. I'm also planning on getting him some bourbon but haven't gotten time to hit the store when it was open. I am thinking about planning a surprise night out for him too. Saturday we got up, I worked for a couple hours then we ran errands and came home to watch two movies. We rented "flight" and also watched the "skyfall" movie. "Flight" was good but not the ending I wanted. Then Sunday we hit brunch and then went and saw the movie "silver lining playbook" which was cute and funny. I'm getting ready for the oscars next weekend by seeing all these movies. My vote is still on django but I am excited to watch! Today I am back at work which is why I typically post later in the morning or day. I'm anxious for noon here because Robie Creek registration opens and the race will be on to see if I can get in. We'll see. There are a couple other options if I don't make it but cross your fingers! I'm back on the clean eating again and am considering doing the advocare cleanse. Ugh just don't know if I can give all that up for 10 days hahaha. 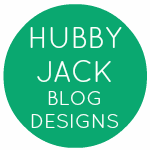 Finally, be ready for tomorrow because I am giving away a $25 Target gift card. I would've done it today but I'm going to use rafflecopter and haven't set up my account yet. So please come back tomorrow and pass the word along!